See Ken Endo present his work at our EmTech conference. Robotic limbs are usually packed with multiple powerful motors, making them heavy and bulky. Engineer Ken Endo hit on an idea for lightening and streamlining the limbs: replacing some of the motors with a series of springs. His goal isn’t to build better robots; rather, he wants to make prosthetic limbs and orthopedic devices that can, as he puts it, “eradicate disability.” He hopes to make artificial limbs that function nearly as well as real ones, affording amputees near-effortless motion with no discomfort. As a PhD student working in the MIT Media Lab’s Biomechatronics Group, led by Hugh Herr, Endo created the first computer program that closely simulates human walking, a surprisingly complex motion. Now back in his native Japan as a researcher with Sony, he’s enlisting that model to build legs with spring-based ankle and knee joints that he says work much like the real things. “The ankle joint also requires a motor,” he notes, “because the human ankle generates a huge amount of mechanical power.” But most of the work will be done by the springs, he says, making the legs far more efficient and leaving the wearer less tired and sore. Endo is now perfecting his joints on a walking robot. He hopes to have the bugs smoothed out in mere months, at which point he’ll start working to make the device suitable for amputees. 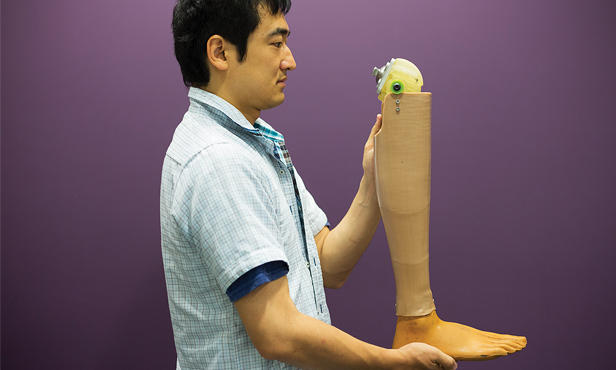 Another big challenge Endo has taken on is making prostheses affordable. More than half of all amputees live in poor countries, where many are victims of land mines. The price tag of $35,000 or more for a high-quality prosthetic leg in the United States is far out of reach for the vast majority of these amputees. To address that, Endo has been working to design prostheses specifically for people in developing countries and to find ways to distribute them there. He has already achieved one breakthrough: a leg costing about $30 whose knee joint can bend when the leg is lifted off the ground but locks into place when the leg is weighted, leading to a less effortful, more natural-looking gait.